Cherry Tree Hill Primary School Council members with, Jonny McPhee, Invictus Communications, left; Headteacher Paul Appleton and teacher Rose Durno. 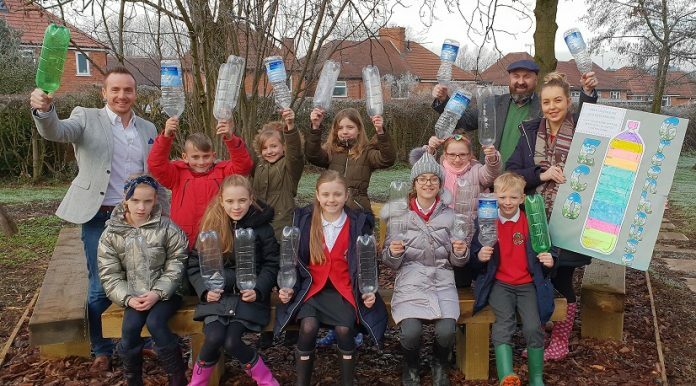 Local telephony specialists Invictus Communications has pledged support for plans by a city primary school to build its first greenhouse using plastic bottles – enabling pupils to grow their own flowers, fruit and vegetables. Cherry Tree Hill Primary School in Chaddesden has collected 1,300 empty plastic bottles which will be used to build the greenhouse. They will be helped by members of the local Rotary Club and plan to have the greenhouse ready by Easter. Headteacher Paul Appleton explained: “The greenhouse will be built alongside our pond and will be a lovely place for children of all ages to help sew and tender the plants. Invictus Communications Managing Director Jonny McPhee added: “As a local business, working for local businesses and committed to supporting local communities – we were keen to help Cherry Tree Hill Primary School with this great initiative.